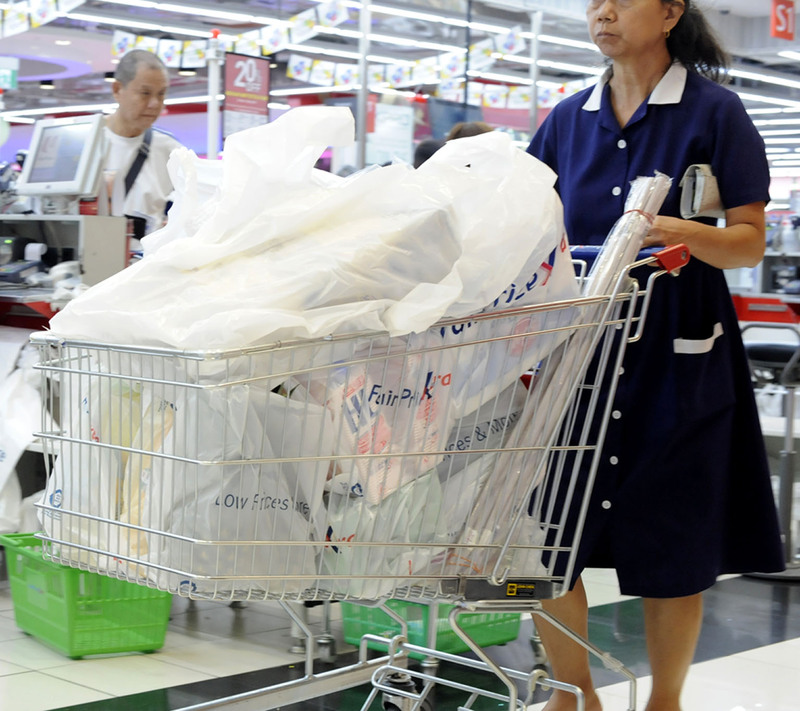 The National Environment Agency (NEA) is in discussions with the four major supermarket chains - FairPrice, Dairy Farm Group, Prime and Sheng Siong - to introduce a charge for plastic bags. The objective is to reduce the burden of waste disposal. Singapore consumes more than 800 million tonnes of plastic each year, but recycles just 7 per cent. Incinerating the plastic generates carbon dioxide, contributing to global warming. The residual ash adds to the limited landfill at Pulau Semakau. A charge for plastic bags would deter consumption of plastic bags and help to reduce environmental costs. Charging for plastic bags, however, may have unintended consequences for public health and estate cleaning. It would affect how people dispose of food waste and increase the spread of vermin and diseases. One of the great conveniences of Singapore residential living is the ubiquitous rubbish chute. Toss the waste into the hopper and, instantly, it is out of sight, out of mind. Banana peels, vegetable scraps and chicken bones all drop to the ground, becoming someone else's problem. Free plastic bags at least encourage people to wrap their food waste before tossing it into the chute. Even so, the long fall may tear the bags, causing contents to spill. So, unlike many advanced economies, we need daily rubbish collection. If not, the problem of cockroaches and rats would be worse. The combination of free plastic bags and rubbish chutes is an application of the economic principle of "second-best". Generally, this economic principle states that, if the allocation of resources in two related domains is distorted, correcting a distortion in one domain might amplify the distortion in the other domain, and so, reduce overall welfare. The economic principle of "second-best" explains why the Government subsidises the infrastructure of train and bus service. Private cars cause congestion, which is a negative externality. The obvious way to correct this externality is to charge for congestion. As we cannot completely charge for congestion, subsidising public transport is the second-best policy. It is obvious that free distribution of plastic bags leads to excessive consumption of plastic bags. Equally, it is almost axiomatic that ready access to rubbish chutes encourages people to discard waste without proper care. Removing the subsidy for plastic bags would just exacerbate the careless discard of food waste. Advocates of charging for plastic bags have cited a similar policy in Hong Kong as an example. Yet, they may not be aware that the design of many residential buildings in Hong Kong differs from those in Singapore. My wife's family lives in Hong Kong. Their flat does not have a rubbish chute. Rather, a cleaner goes to each of the building's 24 floors to clear rubbish from a common bin at the fire escape. Newer apartment blocks in Hong Kong do have rubbish chutes. Concerned about the proper disposal of food waste, the estate management gives free rubbish bags to residents liberally. And, of course, the rubbish bags are made of plastic. So, any gain from reducing the consumption of supermarket plastic bags should be balanced against the increased consumption of rubbish bags. Back to Singapore. We already have a serious litter problem. It suggests that, generally, civic consciousness is at a rather low level. If plastic bags cease to be "free" (actually, they are not free, they are bundled with groceries), then more food waste would be directly thrown into chutes. More cockroaches and fatter rats. Some have suggested that people can wrap their food waste in newspapers. Are they serious? How would they like to clear the bins at the bottom of each apartment block? This is a job that no Singaporean wants to do. Making the job even more unpleasant will only increase our reliance on foreign workers. I do not know if there has been any complete study on the effects of charging for plastic bags on total consumption of plastic bags (including purchases of rubbish bags), public health and the cost of estate cleaning. Absent a clear understanding of the costs and benefits, I suggest that the NEA carry out a trial in one town. Measure the actual change in plastic consumption. Monitor the effect on public health. Gauge the impact on cleaners and cleaning contractors. Then decide whether it makes sense to roll out the policy to the whole nation. The writer is distinguished professor in the NUS Business School and Department of Economics. He is the principal investigator of Spire, a five-year project funded by the Social Sciences Research Council to research service productivity.